Gonna pop a can of corn to make a casserole. What??? sharpness 15? is this for real. lol. Thanksgiving wasn’t always like it is today. It used to be a holiday of festivals and children begging for food or money, a little like the Halloween of today, costumes included. Only when Sara Josepha Hale decontextualized the holiday as a domestic family meeting, where distant sons and daughters come home for a family feast, the holiday that now seems natural culture started taking form. She desperately tried to get the last Thursday in November recognised as this national holiday, as the nation was sliding into civil war. Thanksgiving, she hoped, might hold the nation together under the belt of brotherhood and gratitude, a fragile union. Though what happened happened, in 1863 president Lincoln did make thanksgiving a federal holiday, rewritten as something that happens indoors, a joyful reuniting, as they felt not the war, but industrialisation was ripping apart family bonds, and with that the ties and values at base of the nation. The holiday lost its tolerance to begging children and drunken marchers. It picked up new traditions, like the football games and as more and more people started celebrating, foreign cultures were both absorbed into and erased by the dominant culture. The many side-dishes could be a metaphor for these twin tendencies. Many cultures incorporated their past in the meal, as one of those, but the turkey continued reigning over all. TomvanWijnen, MatthewDA, Esrik and 1 other person like this. We hope that each and every one of you have a marvelous Thanksgiving, filled with friends, family, and good times. Even if you don't celebrate Thanksgiving specifically, we wish you the best this week and hope you'll join us for some Turkey Day festivities this week. The turkeys are back, and they've come for revenge. All those years you've sat around whacking at them for extended amounts of time while they sat their helpless are OVER! Thanks to the Survival Update 2.0 our wonderful developers have provided, the Super Turkeys are prepared to put up a fight if you want a piece of their juicy goodness. Some resilient turkeys from last year may have already been fought. While they've been re-balanced health wise to accommodate for this, they still have a chance of dropping a Turkey Slicer, and of course that delicious Cooked Turkey. We wish you luck in your turkey hunts! This year's promotional tool is the almighty Can Opener. Be careful while handling this powerful pick. It will open cans of cranberry sauce in a blink of an eye (and possibly take out whoever is standing nearby too). I'm sure we'll be seeing these in the PVP arenas with the other Thanksgiving tools/weapons soon! Type /promo thanks18 for a free one! Can Openers will ALSO be available in the /shopworld for 30,000r each throughout the Turkey season (estimated 10 days). Don't forget that we have an ongoing build contest. You've still got until the end of the Thanksgiving weekend to finalize and submit your giant dinners. Good luck to all participants! Once again, have a happy and safe Thanksgiving everyone. We'll likely have some Thanksgiving events over this extended holiday weekend, so be sure to keep a close eye on the forums! Yeessss, I've been waiting for the super turkey! You need more modding for that. 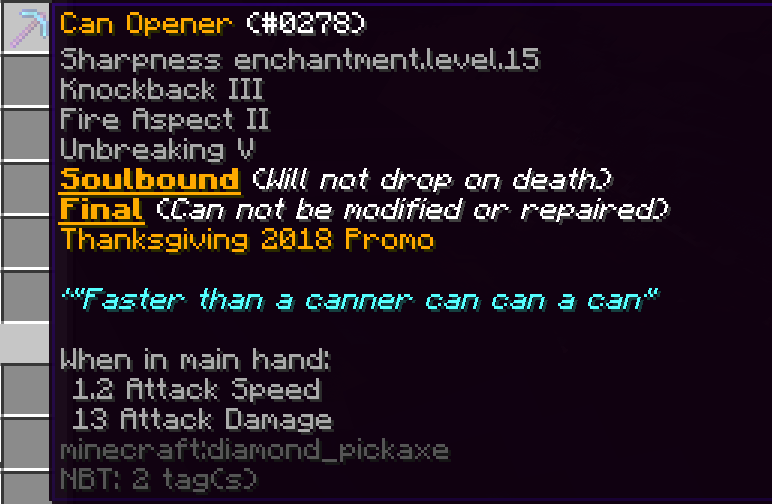 The actual tag of the item in the game-code is the same with this enchantment.level.15 and XV, it's just that the game doesn't recognise something above 10 (I beleve) as an enchantent. having a quick look through the code, I think you also need some client-side stuff, though I'm not that good at Java. It is possible, but would probably take something like 5 or 6 hours to make work with changes server-side only, without adding any extra tags that could break the item when upgreading to later minecraft versions, which, I would say, isn't worth it. You know what it means and it, realistically, isn't that big of a deal. Realistically, the only person who can say for sure is someone who knows their stuff, someone who has done proper studying of coding, not just some random guy who sometiems likes to hackfix bugs he's anoyed by, of course. 607 and ConqueringRuler like this. Anything over 10 it does the wonky wording for with our current system. We've discussed a workaround for it though, for future use. that pickaxe is beyond lethal.